The well known garden herb so often relied on to flavour or enhance food, has many wonderful properties for everyday use. Aromatic, stringent and bitter constituents of Sage make it particularly suitable for those who experience excessive sweating associated with the menopause, based on traditional use only. The volatile oil of sage contains the constituents alpha- and beta-thujone, camphor, and cineole. It also contains rosmarinic acid, tannins and flavonoids. Sage Leaf in this product has been collected from the wild in accordance with "Good Agricultural and Collection Practice" (GACP). No pesticides or herbicides have been used in production of the material ingredient which has been tested to demonstrate absence of such compounds. Sage Leaf. (Salvia officinalis L.), Hypromellose (capsule shell). For the relief of excess sweating associated with the menopause. Take 1 capsule daily swallowed with water. Not recommended for children or adolescents under 18 years of age. 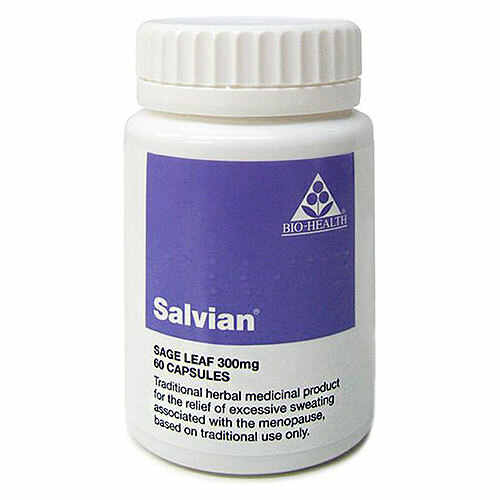 Patients with known hypersensitivity to Sage Leaf should not use Salvian. Below are reviews of Salvian - Sage Leaf - 60 x 300mg Capsules by bodykind customers. If you have tried this product we'd love to hear what you think so please leave a review. No more night. 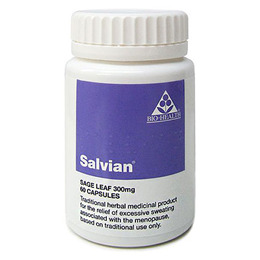 Sweats ..
Salvian is a traditional herbal medicinal product containing Sage Leaf for the relief of excessive sweating associated with the menopause.